Ryan McNaught used his expert Lego building skills to do as the Romans did - and build an oversized model of the Colosseum! Made from over 200,000 Lego bricks, the epic model is split between the current ruins and a vision of what the Colosseum looked like during its heyday in 80 AD. The certified Lego builder’s masterpiece is on display at the Nicholson Museum in Sydney, Australia for the rest of the year. Drawing upon his expertise, McNaught accomplished a near-impossible feat: building a giant oval shape out of Lego square bricks. Half of the structure is represented in its original splendor, with Roman soldiers stationed outside and a beautiful Lego “fountain” in the outside courtyard. The perfection bleeds into the current state of the landmark, with Lego pieces missing in scattered places, representing the decay the building has faced over the past 2,000 years. The same dichotomy is present inside, with half of the floor missing to reveal the hidden chambers below ground. The jagged Lego edges replicate crumbling stones that lead to the basement and catacombs of the Colosseum. 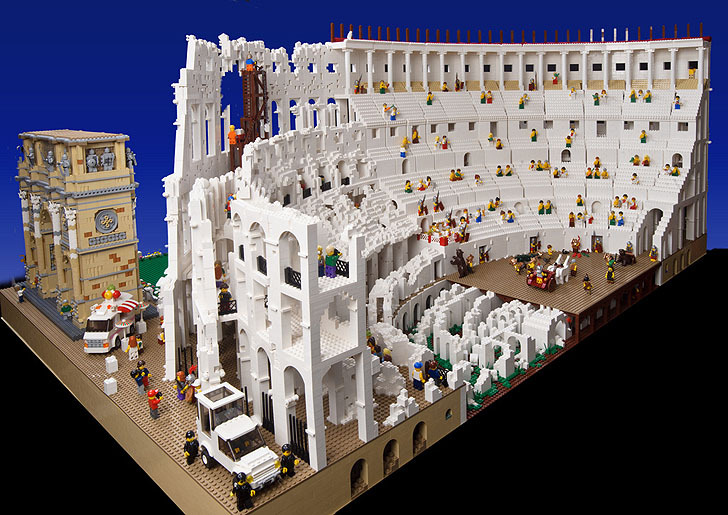 The right side shows gladiators in the throws of battle, with an audience of onlookers sitting on the Lego stadium levels. Roman soldiers line up in response to a leader with his horse. Under the floor, prisoners are tortured in the antechambers by spear-carrying soldiers. Outside, modern day tourists sit aboard a bus bound for the Arch of Constantine. McNaught’s incredible feat of Lego architecture is the designer’s largest and most impressive to date. His museum-worthy Lego building will be on display until January of 2013. With his expertise, McNaught did the nearly impossible, building a giant oval shape out of Lego square bricks. Half of the structure is crowned with its original splendor, with Roman soldiers stationed outside, as well as a beautiful Lego “fountain” in the outside courtyard. The perfection bleeds into the current state of the landmark, with Lego pieces missing in scattered places, representing the decay the building has faced over the past 2,000 years. The same dichotomy is present inside, with half of the floor missing to reveal the hidden chambers below ground. The jagged Lego edges replicate crumbling stones that lead to the basement and catacombs of the Colosseum. 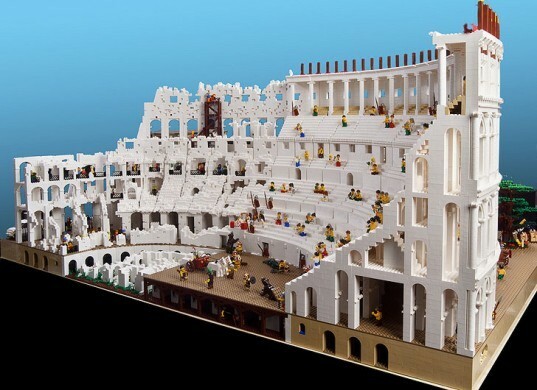 The right side shows gladiators in the throws of battle, with an audience of onlookers sitting on the Lego stadium levels. Roman soldiers line up in response to a leader with his horse. Under the floor, prisoners are tortured in the antechambers by speared soldiers. Outside, modern day tourists sit aboard a bus bound for the Arch of Constantine. McNaught’s incredible feat of Lego architecture is the designer’s largest and most impressive to date. His museum worthy Lego architecture will be on display until January of 2013.